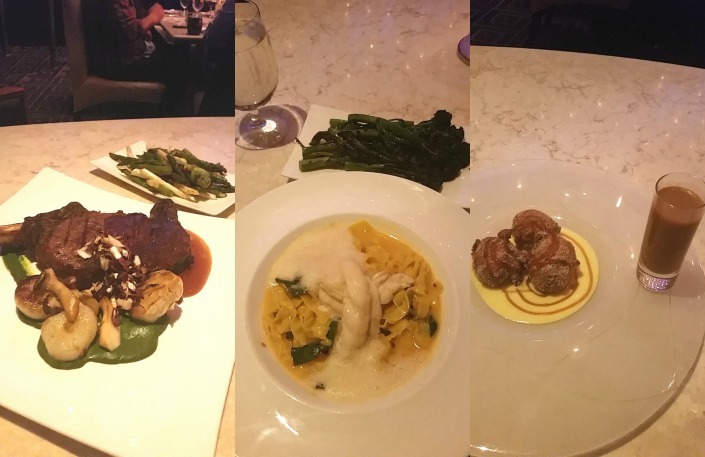 For a luxurious and romantic date night, consider staying at MotorCity Casino Hotel and dine at Detroit's 4 star restaurant Iridescence! Since Adalyn was born, Troy and I have not had many date nights where we get to spend time just the two of us (outside of the house). 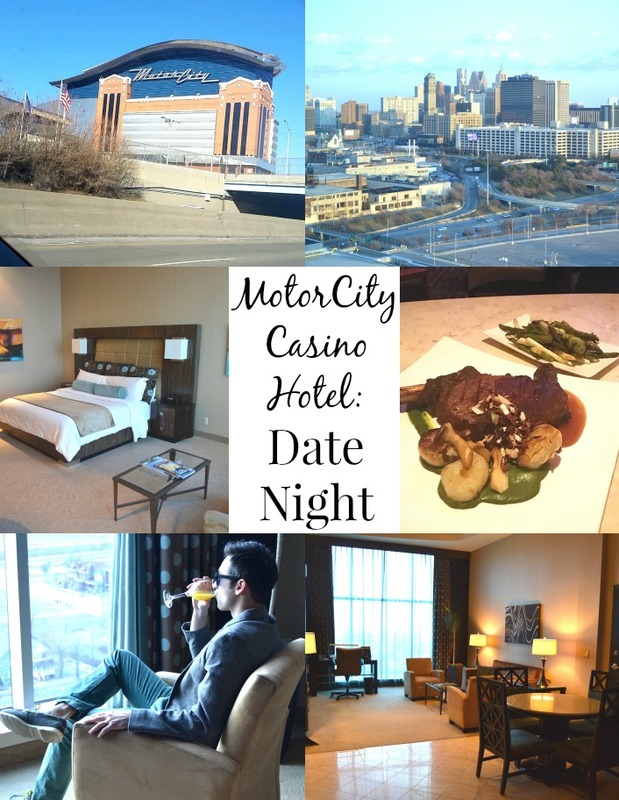 I recently had the incredible opportunity to stay for a night at the MotorCity Casino Hotel and it made the perfect romantic date night with my husband. We got to spend quality time together and truly enjoy ourselves. The night started out when we checked into our hotel mid-afternoon. We were surprised with a beautiful, gigantic suite which was easily the nicest hotel room that either of us have ever stayed in. It had incredible views of downtown Detroit and had 2 bathrooms, a huge living room and a bedroom. Everything was top notch. 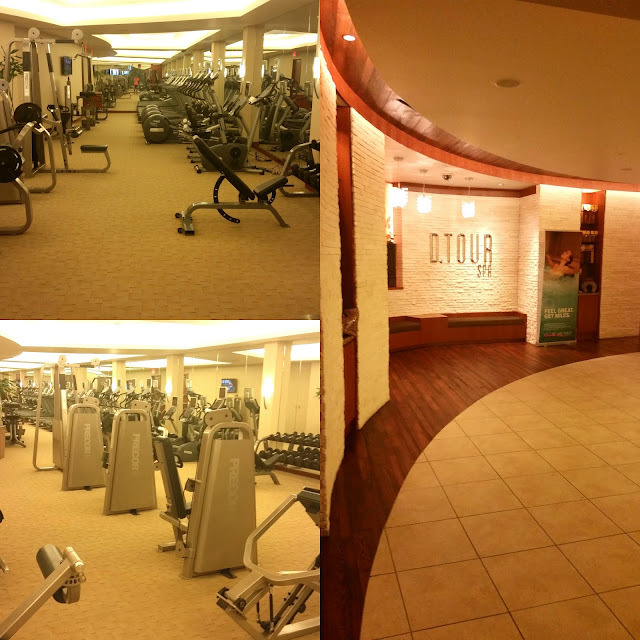 Since I was reviewing the hotel, I kept a close eye on cleanliness everywhere that we went in the hotel and found everything to be extremely clean and well maintained. I was impressed. The staff was so much friendlier than any staff that I have seen in the US before and was constantly saying hello, smiling and asking us if we needed anything. The room had a mini bar complete with snacks and there was a coffee maker with Starbucks coffee which were nice touches. Since we were staying in a suite, we had access to the Butler's Lounge on the 15th floor where we had appetizers in the evening and breakfast the next morning. I love that they had veggies and dip, shrimp cocktail, pierogi, cheese and more. 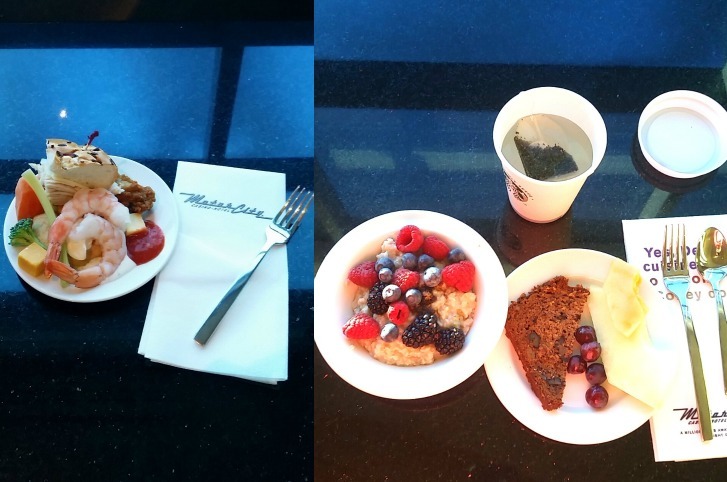 In the morning, we had coffee, tea, oatmeal with fresh berries, fresh fruit, zucchini bread and bagels. Before dinner, we had some time to explore the casino and the hotel so we walked around for about an hour. I had never been to a casino before and it was crazy! Tons of machines with flashing lights. Wow. It was neat to see but not my kind of scene so we didn't spend too much time there. We headed back to our room to get ready for dinner at Iridescence- a beautiful 4 star restaurant on the 16th floor of the hotel. 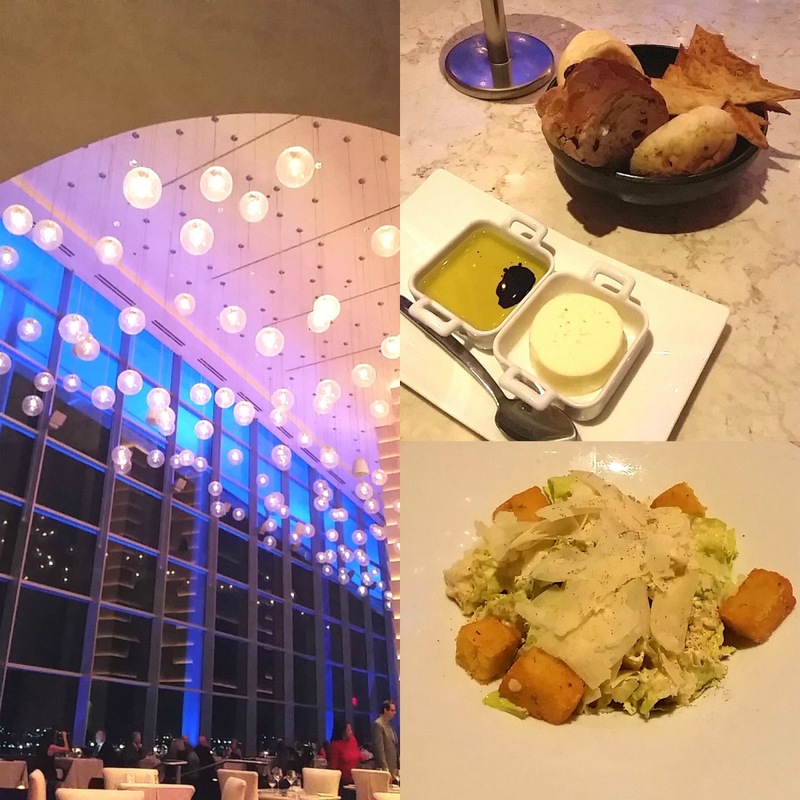 Dinner at Iridescence was one of the best meals of my life! Everything was incredible and Troy and I had fun tasting so many items and discussing them. We started with an awesome bread basket with asiago crispy toasts that I loved. Then, we ordered kobe beef sliders with blue cheese and BBQ sauce which was one of my favorite items from the night. Troy had a caesar salad with polenta croutons which was very unique. They were crispy on the outside and soft on the inside. I ordered the beet salad which I loved. It had crispy beet chips and oranges. Troy typically dislikes beets but I had him try the beet chips and he liked them so much he had three of them! Tied along with the kobe beef sliders was the mushroom toast for our favorite dish of the night. We actually did not order this dish but the chef sent it out to us to try. I am so glad that he did! We took a bite and both said "OMG this is so good". We also got to sample a lobster corndog. For my entree, I ordered the Maine lobster chitarra pasta which featured lobster tail, house-made saffron chitarra pasta, lobster essence, uni bottarga, baby swiss chard and blistered tomatoes. I also ordered a side of broccolini which I loved (I love my veggies!). Troy ordered the prime ribeye which is a 24 oz 21-day dry-aged ribeye with creamed spinach, roasted garlic aioli and sweet onion jus. I loved the creamed spinach especially and Troy was very happy with his steak. We finished off dinner with some incredible desserts which we were only able to take a bite of since we were so full: the most incredible pumpkin doughnuts with a caramel apple cider shooter and goat cheese cheesecake. Wow, the meal was so amazing and we had the best time. This would make the perfect date night destination. Troy and I love to dress up and were happy to find out that it was a place that lots of people wore dressy attire to. 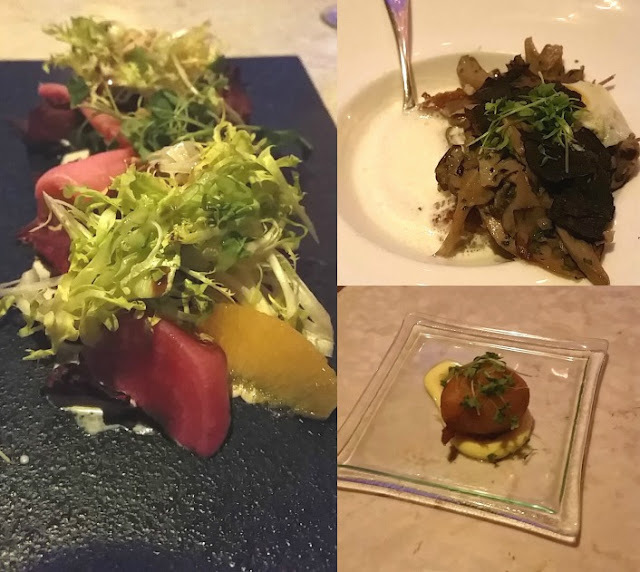 The service at Iridescence was incredible. The waitress was very knowledgeable about the food on the menu. We constantly had our waters refilled. The staff was very polite. I was so impressed. Troy and I are already talking about how we would love to come back for something like our anniversary. 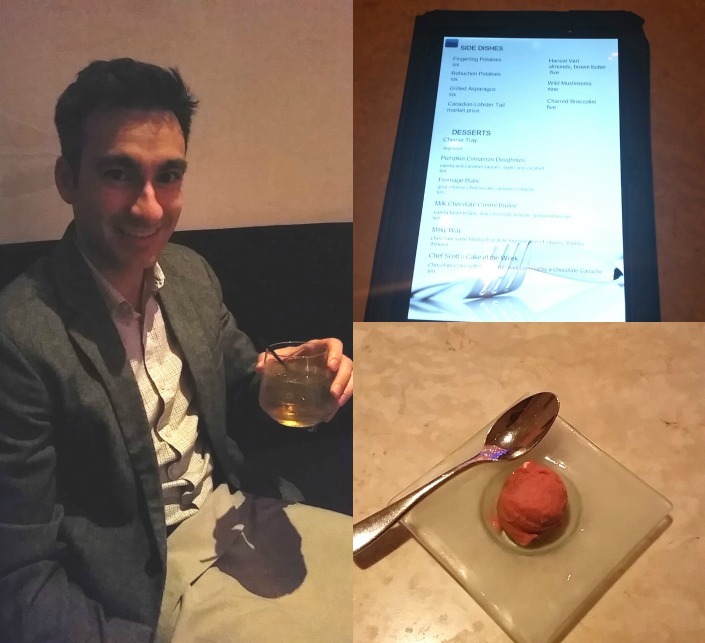 Something that I loved it that you get to look at the menu on an ipad which allows you to see pictures of the food. This helped me to decide what to order. We left dinner, had a glass of champagne in our room and then headed down to the casino. This was my first time gambling and it was interesting. We ended up only staying for about half an hour before going back to our room to have our own little party. We were sent up some chocolate covered strawberries which was very nice! I have a really hard time sleeping at hotels and actually slept quite good here. The bed was very comfortable and I loved the blackout curtains. The next morning, I headed downstairs to the gym and was very impressed. There was a bunch of workout machines and I tried ones that I had never used before. The gym was super clean and they had water bottles on each machine along with cold towels. Some of the most awesome features of this room were in the bathroom. There was a huge jacuzzi tub along with a shower with multiple heads. I loved the spray jets in the shower. It was like being at a spa. The bathroom mirror had a TV in it which I had never seen before and was impressed with. I got in the tub for a bit and loved the faucet. I want one like this at home! The tub is huge which I loved being able to be comfortable in. The jets were so relaxing. 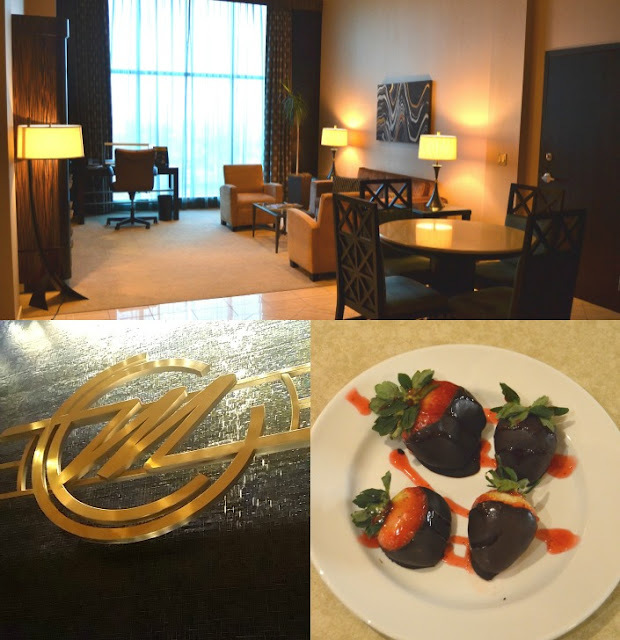 My husband and I had an incredible time at MotorCity Casino Hotel. 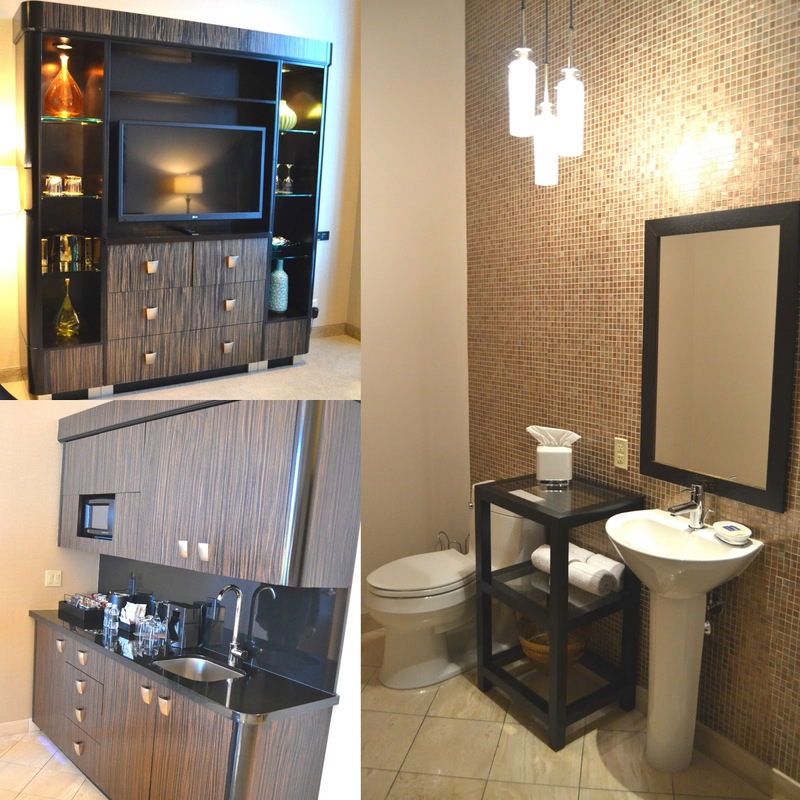 Staying there is a very luxurious experience and I would highly recommend it for a date night. I hope to return again and would give this hotel 5 stars. My only complaint about anything was that I did not like the smoking in the casino and our room took about 40 minutes to get ready when we checked in. Other than that, everything was absolutely perfect. 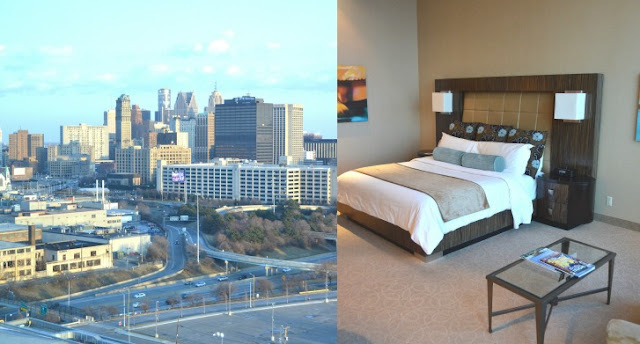 Disclosure: Thank you to MotorCity Casino Hotel for providing us a complimentary night in your amazing hotel and dinner at Iridescence. All opinions are my own. Oh wow, that looks like such a beautiful and swanky hotel! A small getaway is always needed for couples, especially when they have children. Some time away is just necessary to stay sane! That was an incredible post describing your activities at the motel! It was kind of interesting to see how you read an ipad menu to view the food before you ordered it. I had never heard of that before. I would like to try more new foods, myself so it was really something to hear and see what you both were eating. My husband and I are more conservative and do not care to gamble, so we'll pass on that part. Also, I know by experience that wherever you find "gambling," you will find "smoke".